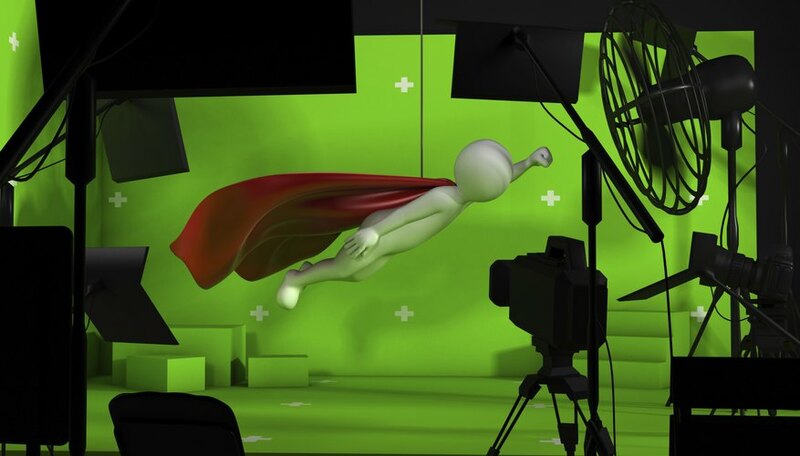 Green screen -- or blue screen -- compositing is an invaluable tool for filmmakers and television producers, allowing, for example, characters to visit far-away planets or interact with virtual creatures. While you may associate this technique -- also known as chroma key -- with modern-day blockbusters such as The Avengers or Gravity, it actually dates back to the early days of filmmaking. In the early 20th century, filmmakers were able to use a technique known as matte painting to superimpose painted elements over a scene. This technique, which is still in use today, allows special effects artists to add static elements -- such as a castle, an abandoned spaceship or a crater -- over a scene. Early matte paintings, however, did have two serious limitations: they could be used only for static shots and, because they were added on top of existing footage, characters and props had to remain away from the area covered by the matte to avoid breaking the illusion. To overcome these limitations, a cinematographer named Frank Williams came up with an innovative technique in 1916 known as traveling mattes. Unlike standard mattes, traveling mattes contained moving elements such as actors or vehicles. To create a traveling matte, actors were shot in front of a black background. By copying the footage on high-contrast film, special effects artists were then able to separate the actor from his background and add him on top of a background shot. You can see this technique in action in the classic 1933 movie, The Invisible Man. While Frank Williams' technique helped filmmakers of the black-and-white era expand their horizons, it did not work with color movies. This limitation led innovative special effects artist Larry Butler to come up with a new technique that would support color movies and allow feature filmmakers to create a single sequence out of multiple shots -- something known as compositing. By shooting actors in front of a blue screen and processing the resulting footage using optical printers, the technique Butler invented allowed filmmakers to separate the background from the actors. The footage of the actor could then be added to any background shot, such as a desert, a lunar landscape or the bottom of the sea. Using different lenses when shooting the matte footage and the background shot, the directors of the 1940 movie, The Thief of Bagdad, were able to turn actor Rex Ingram into a gigantic genie. While Butler pioneered the art of compositing, his technique also had its own limitations and was not able to accurately separate fine details such as hair from a background. To overcome these limitations and improve the quality of footage created using compositing, special effects engineer Petro Vlahos developed a new compositing technique in the 1950s. By using a revolutionary process involving 12 separate compositing elements, Vlahos' technique could remove blue or yellow backgrounds from scenes while preserving fine details such as hair. While computers have now replaced optical printers, the chroma key technique is still based on the same process Vlahos invented more than 60 years ago. Nowadays, special effects artists and TV producers rely on chroma key to shoot countless shows and movies, from morning talk shows where weather forecasters deliver their predictions in front of a virtual map to fantasy shows such as Game of Thrones where realistic dragons interact seamlessly with actors.